We have a brand new trailer for Venom. Sony made a deal with Marvel Studios a few years ago to finally allow for Spider-Man to appear in the Marvel Cinematic Universe. Sony, though, has not been content to just sit on their hands and collect the cast from the Tom Holland Spider-Man movies. Instead, they're working on an entire spin-off universe, utilizing other characters from the world of Spider-Man, and that starts with Venom, which we now have a much better look at thanks to this new footage. With Venom set to arrive in theaters this fall, it was highly expected that this new trailer was going to debut at San Diego Comic-Con. It very well did, but the studio made fans who couldn't attend the event wait a little while longer to get a look at it. With Marvel Studios skipping out on SDCC this year, it paved the way for other studios to come in and try to steal the show. Sony did their best to try and steal at least a little bit of that thunder. This comes after the initial teaser for the movie proved to be divisive. While some were excited at the prospect, many die-hard comic book fans weren't impressed with the take on the material. The studio made the right move by casting a huge name in Tom Hardy in the lead. It's pretty amazing that he actually agreed to do it. That said, a large part of the appeal when it comes to Venom has always been as an adversary to Spider-Man, not so much as an anti-hero, which is how this take on the character is being pitched. But the villain has carried his own books in the world of Marvel Comics and has become an anti-hero several times. It's been previously revealed that the plot of this movie will take inspiration from the Lethal Protector and Planet of the Symbiotes storylines. It's also been made clear multiple times that this movie, nor will any of the other Sony spin-off such as Silver and Black, Nightwatch or Morbius the Living Vampire be connected to the Marvel Cinematic Universe. That means Tom Holland's Spider-Man won't exist in this universe, despite rumors that he may make a cameo appearance. While his appearance is unlikely, we know for sure that, in addition to Tom Hardy, the cast includes Michelle Williams, Riz Ahmed, Jenny Slate, Scott Haze and Woody Harrelson. It's been rumored that Harrelson is playing Carnage, but that's yet to be confirmed. 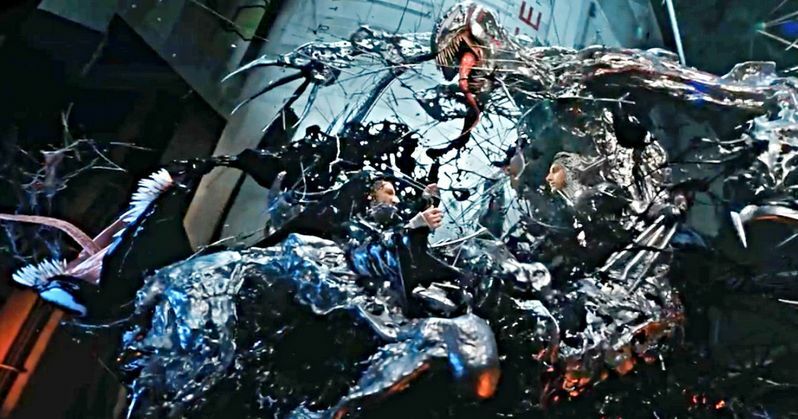 The character of Venom previously appeared on the big screen in Sam Raimi's Spider-Man 3, which is generally considered to be one of the worst superhero movies ever made. Topher Grace's take on the beloved villain certainly didn't help matters. Let's just hope that director Ruben Fleischer, who previously helmed Zombieland and Life, has managed to at least do a little better than that with this solo movie. Venom is set to arrive in theaters on October 5. Be sure to check out the new trailer, courtesy of Sony Pictures, for yourself below.